How does a Tap switch control the Deco? To use a Tap switch with the Deco, you must first set the pedal to TAP expression mode. You can find details on how to set the pedal in this mode here. A Tap switch connected to the Deco’s EXP input will control the Lag Time knob on the pedal. The Tap tempo has a fixed 1/8 note subdivision, so tapping in 1/4 notes with an external tap switch will return 1/8 note repeats on the Deco. How Do I set the Deco to Studio mode? Power up your pedal holding down both Tape Saturation Bypass and Doubletracker Bypass switches. While continuing to hold down, turn the Lag Time knob. When turning to the left, the Tape Saturation LED indicates Instrument Mode. When turning to the right, the Doubletracker LED indicates Studio Mode. If this method does not change the LED status, then your Deco does not have the latest firmware. Please send an email to support@strymon.net and we will help you out. What are the Lag Time ranges for Deco’s Doubletracker? The range of time for Deco’s delayed Lag Deck is from -.3ms to 500ms. More information, including Tips and Tricks for each section can be found in the Deco User Manual. What are the default secondary function values for Deco knobs? Blend [+/- 3dB boost/cut secondary] – 50% for unity gain. How do I change the Bypass mode on Deco? Unplug power to the Deco. Press and hold down both BYPASS switches on the pedal as you plug in the power supply. Then, while still holding the switches down, turn the BLEND knob to light up either the TAPE SATURATION or DOUBLETRACKER BYPASS switch lights. The TAPE SATURATION light sets the Deco to True Bypass. How do I set the EXP input for an expression pedal and control a parameter on Deco? First, unplug power to Deco. Press and hold down both Bypass switches as you plug in the power supply to Deco. While still holding down the bypass switches, turn the Saturation knob completely counter-clockwise to set the pedal to expression pedal input mode. Release the bypass switches. Unplug power to Deco once again. Press and hold down the Saturation Bypass switch as you plug in the power supply to Deco. While still holding down the bypass switch, turn the knob you would like to control with the expression pedal. The maximum setting you turn to on the knob will set the maximum setting for the toe position on the expression pedal. How do I set the EXP input for a TAP/Favorite switch on Deco? While still holding down the bypass switches, turn the Saturation knob to the 12:00 position to select TAP switch mode. A TAP switch connected to the EXP input will control the Lag Time with 1/8th note tap division. While still holding down the bypass switches, turn the Saturation knob all the way clockwise to select Favorite switch mode. Release the bypass switches. To save a Favorite setting, press and hold the Tape Saturation Bypass switch. How do I enable the TRS stereo input on Deco? You can set the input for the Deco for either mono input or TRS stereo input. The pedal ships in mono configuration from the factory. Here’s how to adjust this configuration. 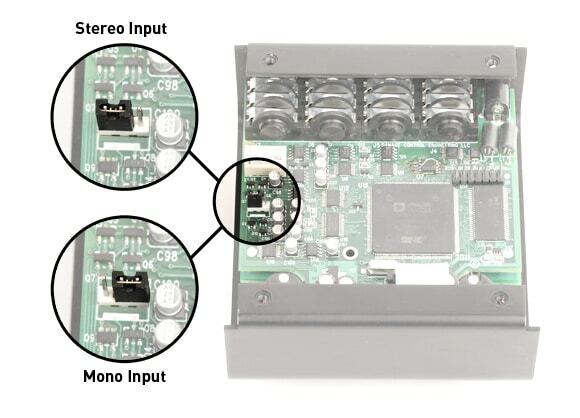 In order to use the TRS stereo input, you’ll need a TRS stereo input adapter like this one. You can purchase one here. Do I have the new Deco features? Since we released Deco, we’ve discovered that there is more interest in studio usage than we had originally anticipated. We want to provide the best possible experience for those who may be using Deco in studio environments, and in setups where a hot input signal is present (synth, very hot effects loop, etc). Given that, we have implemented a new selectable Studio Mode power-up option, which specifically tailors the Tape Saturation range for those applications. To better accommodate players with low output guitar pickups and light playing style, we have extended the range of overdriven saturation at the tail end of the Saturation knob. How do I determine if my Deco has the new features? Power up your pedal holding down both Tape Saturation Bypass and Doubletracker Bypass switches. While continuing to hold down, turn the Lag Time knob. When turning to the left, the Tape Saturation LED should indicate Instrument Mode. When turning to the right the Doubletracker LED indicates Studio Mode. If this method does not change the LED status, then your Deco does not have the update. 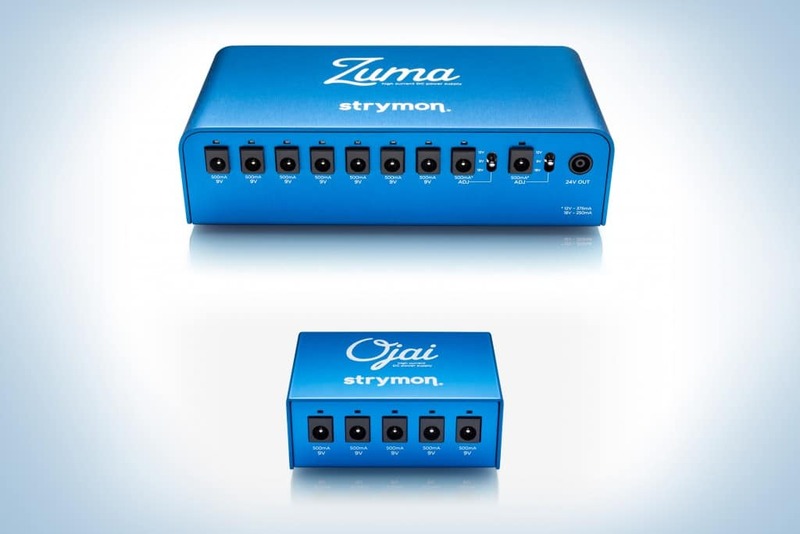 Please send an email to support@strymon.net and we will help you out.